In preparation for my experience here, one of my cultural guidebooks stated plainly that in Sweden "children are sacred." Believing that children are sacred everywhere, I was unsure what to make of this declaration. I soon discovered what this meant. 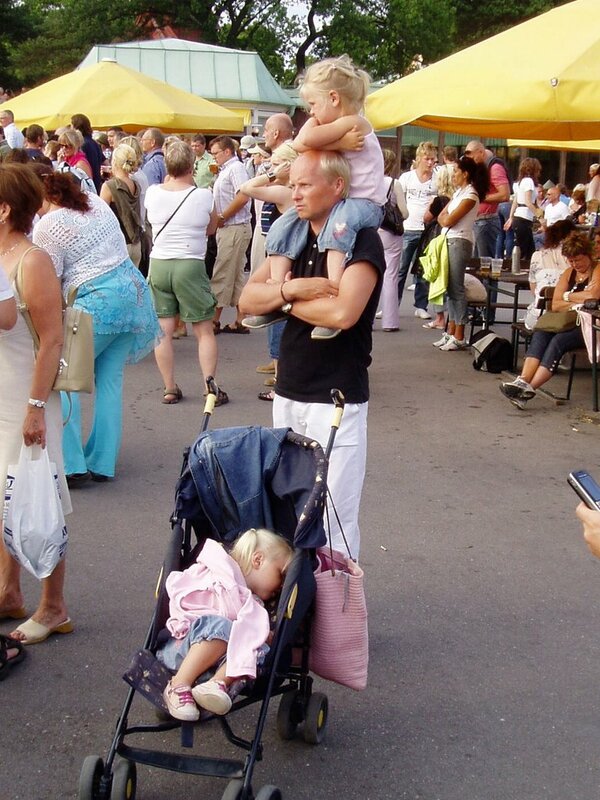 ...strollers. 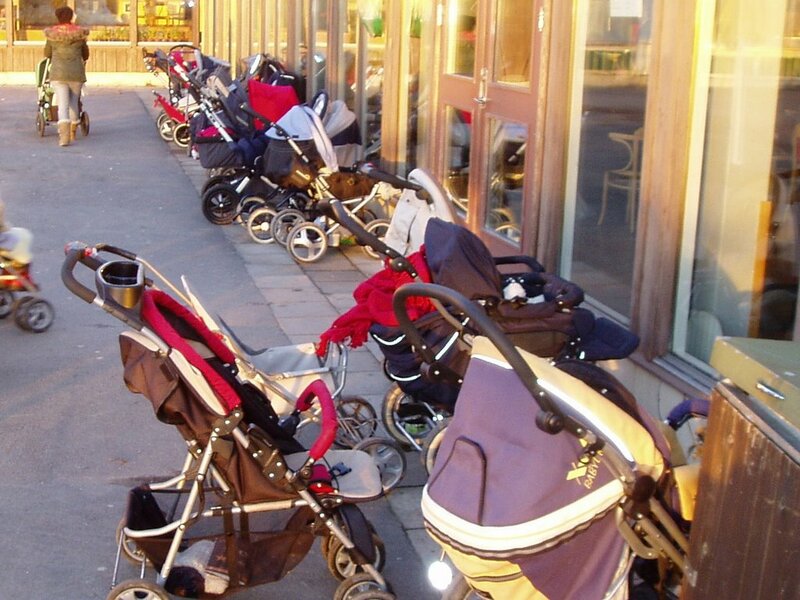 The phenomenon of strollers in Sweden cannot be understated. To a Swede, "strollers" will seem like a mundane and matter-of-fact topic for a blog entry, but that's just the point. 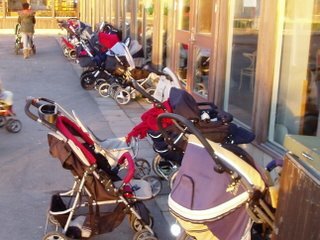 Public places filled with strollers during every season of the year is like air, food, water and "fika" to a Swede. It's always been and always will be, so normal it goes unnoticed. Someone in Södermalm (south Stockholm) even created an icon to this phenonmenon as seen above. 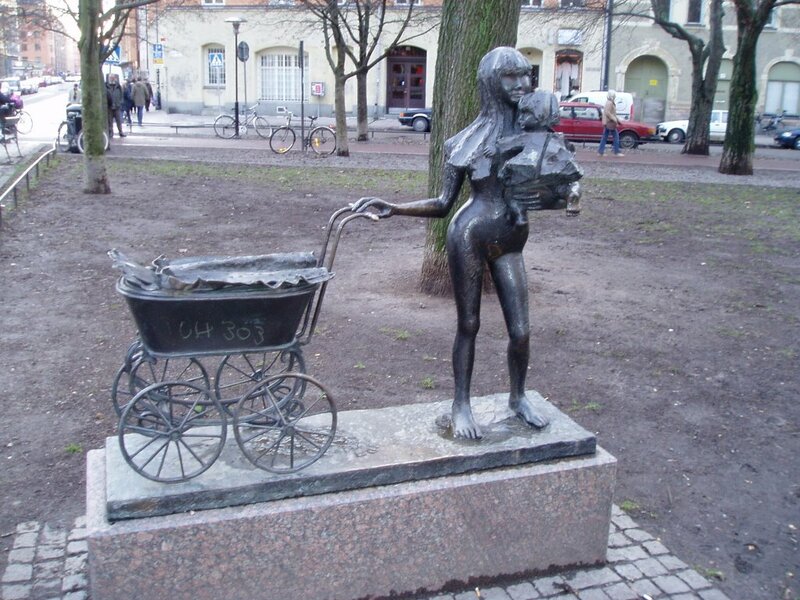 When I saw this statue of mother and stroller, I knew a blog entry was not far off. And these strollers come in all shapes and sizes, often including luxuries that cause strollers to be locked up when not in use. When you come to Sweden and walk around her beautiful cities, make sure to look both ways when you cross the street. If not, you may very well be run over by a bike or a stroller (cars are the least of your worries!). Because the Swedish mother is off for 18 months, mother and child are together all day long, in private, in public and everywhere. The 18 months law gives mothers freedom from work, which leads to children-in-strollers-with-mothers everywhere you go, which only reinforces the "children are sacred" Swedish cultural truism. Not a bad way to run a society, quite frankly. I just can't figure out how the birthrate in Sweden remains similar to other developed countries--from walking around this place, it seems the population would be skyrocketing every year. This Wednesday, Sweden pauses to honor Santa Lucia, Patron Saint of Light. With the daylight being just six hours this time of year (sun rises at 8:30am and sets at around 3pm), Lucia precedes Santa Claus. So next week, we will enter the world of Julbords, Julmarknads, Glögg, Pepparkakor and say "God Jul till alla." Do they give parents the option of letting the dad stay home with the newborn for 18 months? Stephanie: yes, but that much is rare. (The time can be split almost however you want). Most dads still don't stay home at all, although there have been multiple campaigns to encourage it. It's 16 months right for staying home with nwewborn. Stephanie: 16 months is for det mother and the father together. One of them can't take it all, they have to split. I think it's 2 month the father have, and he can't give it to the mother. And the same for the mother. Hmmm ... like a site you would see at Disneyland! And Disneyland is the world of imagniation, what a wonderful place to be. I would have loved to be home with my kids for 18 months, not like the 3 months of unpaid leave I was able to take, and then asked to come back early! Picture this...you, a Swedish parent, sees a strange, tall foreigner with a camera taking pictures of your family, your stroller(s) and a statue of a mother and child. Get back to the cafe, Sean.